Rashtrapati Bhavan of India is the official residence of President of India situated at Raisena Hill in Lutyens Delhi i.e the area of New Delhi designed by Edwin Lutyens. Edwin Lutyens is also the architect of this house, he also designed Indian Parliament and other such important buildings. It was build as an official residence of British Viceroy of India after Britishers declared Delhi as new capital of India in Delhi Darbar of 1910. Its construction started in 1912 and completed in 1929. Don't think I remembered above information from the speech by guide of my group in Rashtrapati Bhavan. Wikipedia is source of above information. Rashtrapati Bhavan was one of many things I haven't visited while living in Delhi since my birth. 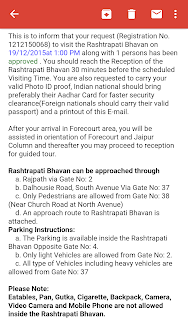 During Internet search I came to know about the way of visiting inside Rashtrapati Bhavan. You have to request it through a link on official President of India's site . There you have to fill your details, identity proof (Aadhar Card is the best options for Indians) and pay non-refundable charges of Rs 25 per person. It's an easy procedure, you receive an acknowledgement on your phone and email address with request number after completing the transaction. The entry is open an Friday, Saturday and Sunday only. I applied on 12th December for visit on 19th December with my cousin. I received the confirmation mail with in an hour. We both jumped in excitement and the week passed in anticipation of that visit. 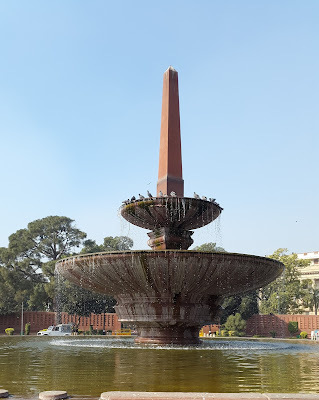 We traveled there through metro, Central Secretariat is the nearest station to Rashtrapati Bhavan and after exiting from gate number five it is on a walking distance via Vijay Chowk. At the gate Delhi police constables checked our names in the list of visitors, matched our Aadhar Card number and directed us to the passage from gate number two. 'First straight, turn left then right,' he said with a smile. 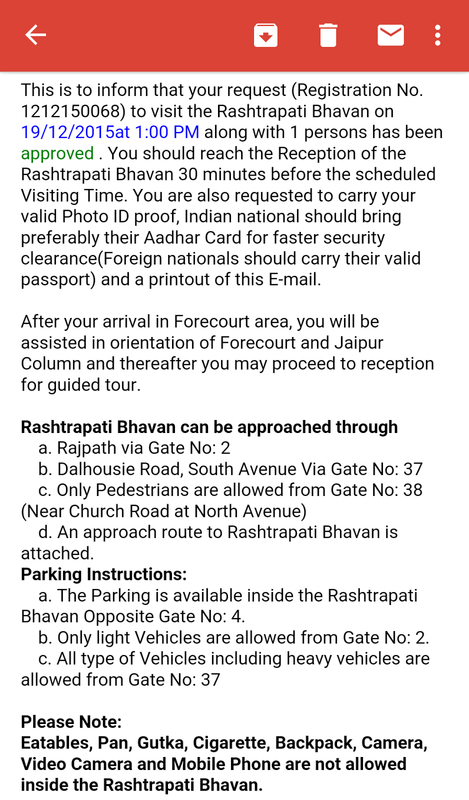 After following instructions and walking over the finest/cleanest road in Delhi we reached the entry gate where our identities were checked and they ordered us to give any electronic items which they kept in a bag and gave us a numbered slip. 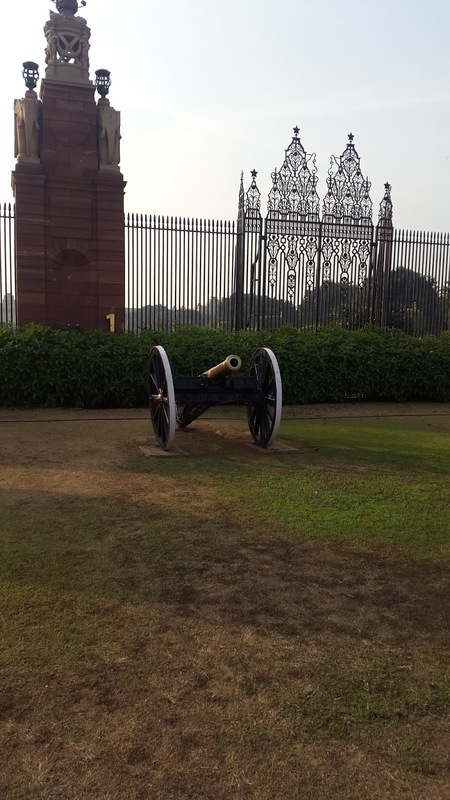 So no photography inside the Rashtrapati Bhavan. We entered a large waiting hall after climbing stairs where other people were also waiting. We were photographed and a ticket with our pictures were given to the guide of our group. Anvita Singh was our guide who took us inside and instructed to remain in the group and to not touch anything. We first entered a small room inaugurated by current president Pranab Mukherjee displaying science models of a gesture piano, robotic dog and 3D printer. Then we entered RB Museum displaying a red stone model of Rashtrapati Bhavan, it was complete replica of the building. Large framed paintings, busts, statue of British emperors, Queens, Viceroys were present in that museum. A staircase downwards from there took us to Kitchen Museum opened on advise of A.P.J. Abdul Kalam which displays cutlery and kitchen utensils used by Britishers. Cooper, Silver, porcelain all types of utensils are on display there. I missed utensils and cutlery sets related to our previous presidents. In these two Museums I felt we are still burdened with British slavery adoring things related to them. I wondered why a democratic country have a position reserved for President who was treated as Royal king and then these things in that house hailing Britishers disappointed me. Here I also mention that the place where Rashtrapati stands today were acquired by Britishers by displacing poor villagers. The land belong to Jaipur royalty who gave it to British to show his loyalty to them without thinking about the villagers. I don't have any problems with Britishers now, there things are valued processions for our country and very much part of our history too but why not things related to our former Presidents were displayed with them. There was lot more in this guided tour which I will tell in my next post. I'd love to visit, one day, though I passed by Rashtrapati Bhavan during an official trip in Delhi way back in 2012. Great pictures, thanks for sharing! Amazing place! Thats great. Did not know visitors are allowed. Waiting for part 2.